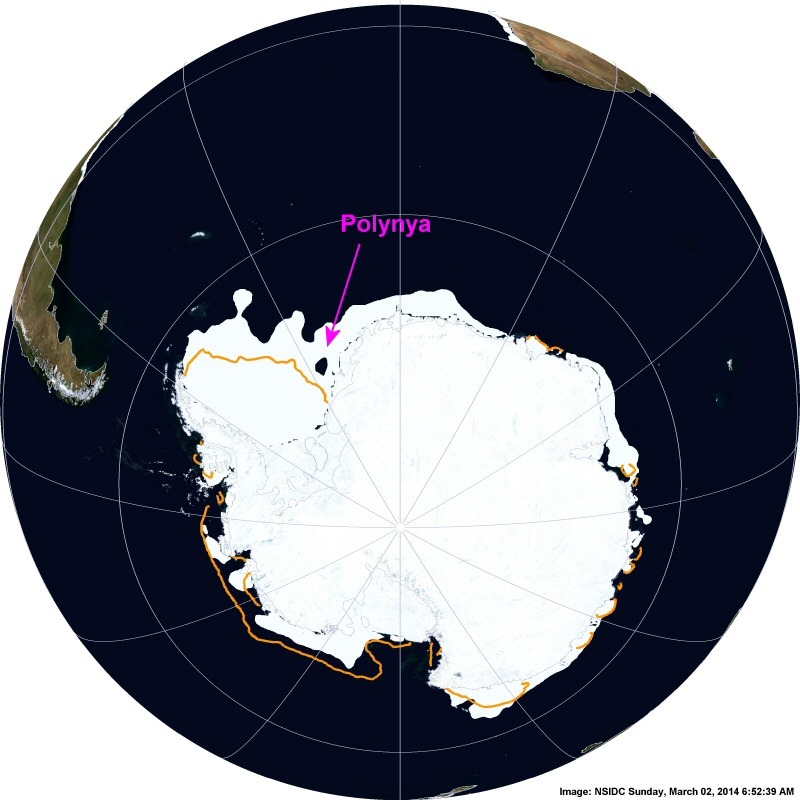 Claim: large Antarctic polynyas to disappear, yet some are still found in satellite imagery | Watts Up With That? The research was supported by the Stephen and Anastasia Mysak Graduate Fellowship in Atmospheric and Oceanic Sciences, by the Natural Sciences and Engineering Research Council of Canada (NSERC) Discovery programme, by the Canadian Institute for Advanced Research (CIFAR) and by computing infrastructure provided by the Canadian Foundation for Innovation and Compute Canada. To help readers understand what they are talking about, here is a pictorial via NSF. In autumn when the ice cover is expanding, the ice acts as a distillation system, separating sea water into low salinity ice and high salinity brine, which sinks and increases the density of Antarctic Bottom Water, a globally distributed water mass. In winter, during its maximum extent, the ice shuts down the exchange of heat between the ocean and the atmosphere, lowering the surface air temperature by as much as 30°F and increasing the reflectivity (albedo) of the surface. In spring, melting releases microbes and plankton that had been growing in the ice and seeds of phytoplankton bloom. In summer it provides a breeding place for seals. For most of the year the transition zone from ice to open water is one of enhanced biological activity, where birds, seals, and whales congregate to feed. The schematic (© Scientific American 1988, after Gordon and Comiso, 1988) illustrates these actions. What they don’t mention in this press release though, is that polynyas near the coast are often the result of Katabatic winds. The Turney Ship of Fools surely knows about what happens when the winds shift and the ice starts packing in when the polynya closes. 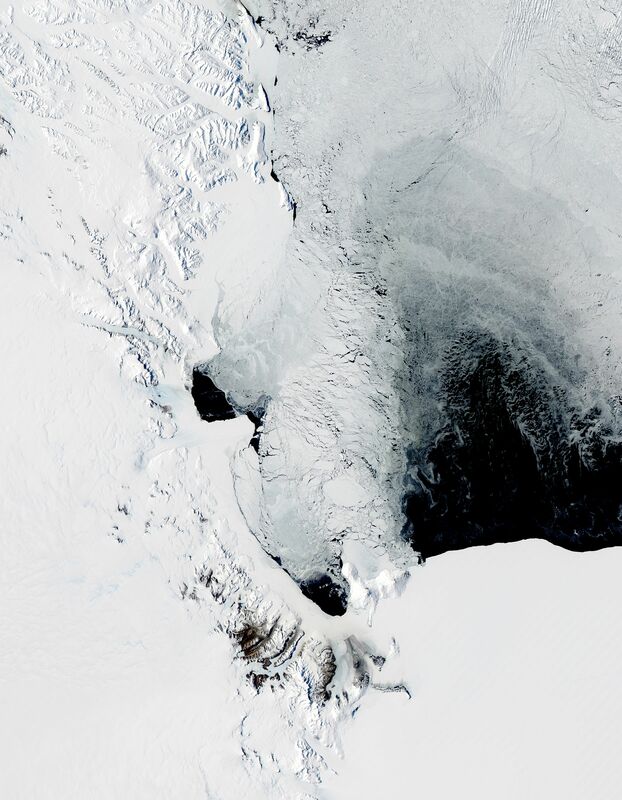 They also don’t mention that a large polynya appeared in November 2011 in the Weddell sea they are wailing about that might be “… the last gasp of what was previously a more common feature of the Southern Ocean…”. The Moderate Resolution Imaging Spectroradiometer (MODIS) on NASA’s Aqua satellite captured this natural-color image of a polynya off the coast of Antarctica, near Ross Island and McMurdo Station on November 16, 2011. The polynya was likely caused by katabatic winds, which derive their name from the Greek term for “descent.” The winds blow off Antarctica’s high interior toward the ocean and can attain hurricane strength—up to 200 miles (320 kilometers) per hour. Strong winds have pushed sea ice away from the coast in this image, but not uniformly. Ross Island and the mountains to the west block some winds, so sea ice lingers near those landforms. Along the lower-elevation area east of Ross Island, winds clear the ice from a large stretch of ocean. North of the polynya, sea ice shows varying degrees of thickness, perhaps the result of alternating windy and calm spells. The orange lines indicate the “normal” sea ice extent for this time of year, and clearly there is more ice than normal in the Weddell sea, but somehow an offshore polynya managed to open up. as well as on the global ocean circulation. One wonders what role these features may have in building up the sea ice increase around Antarctica. While it is certainly possible that the 1970’s polynya was caused by warm water upwelling, it is also equally possible that it was at least aided by a persistent wind pattern. Wind has an equal if not stronger effect on sea ice than upwelling. In 2000, we had no noteworthy polynas in the Weddell Sea. 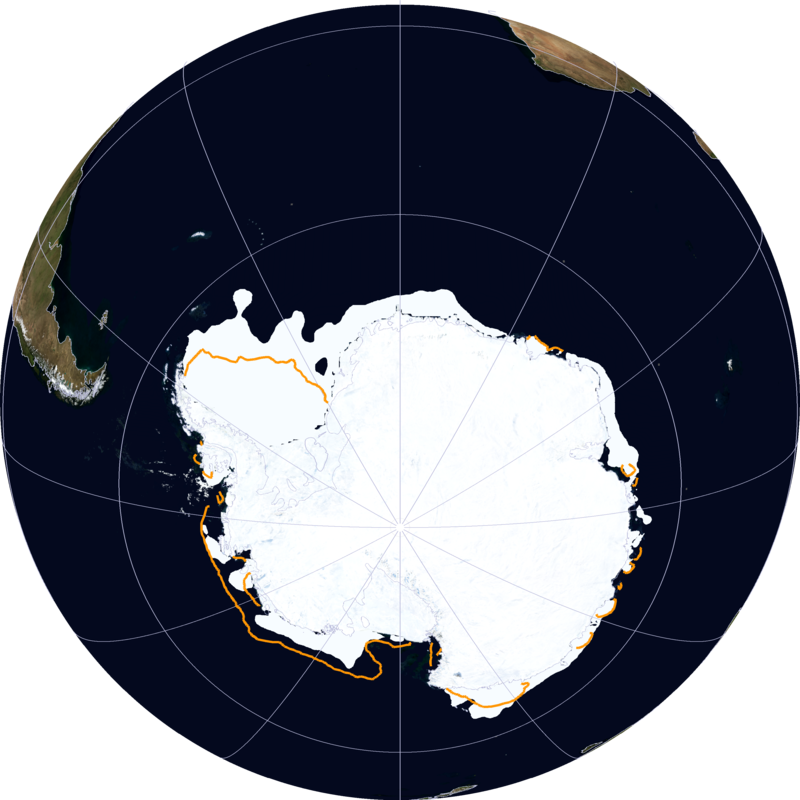 There was only a small area of reduced ice concentration between approximately 26 August 2000 and 2 September 2000. 2001 and 2002 were even more boring. Not even an attempt to form a polynya. In 1999, the Weddell Sea was quiet until mid-July. Towards the end of the month, a sizeable area of reduced ice concentration opened up. This was preceded (in time at least) by the formation of a large polynya in the Cosmonaut Sea in early-mid July. Interesting times! 29 July 1999. 4 August 1999: I’ve got to stop looking at the area. As soon as I wrote the above, the proto-polynya began closing back up. I’ll quit looking for a while, so you may find something happening again. In 1998, while not a full-blown (large area of zero ice) polynya, there was less ice than usual in the Weddell Sea, in the same area as the giant Weddell polynya of the ’70’s. Because the polynya is such a spectacular feature when it does occur, we have established this page to make it easier to keep track of the current state of the Weddell Sea ice pack. What I find most interesting about their claim is they act as if the 1974-1976 giant polynya was part of a “normal” activity there, saying it was “a more common feature of the Southern Ocean”, yet we only have a scant 40 years of satellite data to monitor such events. Suggesting that it is likely to never reappear based on modeling is just as nonsensical as the pronouncements we saw in 2000 that “snowfall is a thing of the past”. The Earth’s mechanisms operate at much longer and slower timescales than 30-40 years, it has often made fools of climate scientists making projections of “phenomena disappearance” before, and I suspect it will again. March 2, 2014 in Antarctic, Climate News, Modeling. When you limit your study to a small portion of both problem and observation, any conclusion is possible. Note that the “no” conclusion will be reached, but “any”. Nature abhors a vaccum but so does a career path and grant application . Muddle-headed wishful thinking. Total crap. Brilliant work, very helpful to know about these matters deep ocean is supposed to hide the missing heat .. so there have to be a reason that we dont see much of it emerging, right? Thanks a lot, this article is a keeper..
We won’t know what snow is. What else will we not know? I have one: We won’t know what good science is. Ah I see. More warming means more ice which means that the heat can be stored undetected beneath it but which will accumulate and break out in a hundred years or so to warm the globe. It is all so wonderfully clear is it not? . Pshaw. I have heard much better tall tales than that. Funny. As I was reading this I was thinking if this happened every 40 years for the past million years it wouldn’t be so “rare” a phenomenon. So let me get this straight… fresh water from melting ice is trapping ocean heat in Antarctica thus warming the oceans and keeping the Antarctic cold…….but in the Arctic open sea and fresh water caused by melting ice is allowing ocean [born] heat to escape into the atmosphere thus warming the Arctic ocean and the atmosphere of the Arctic? Can I become a Climate ‘scientist’ please? I’m not a climate scientist. I’m an expedited driver, so I have some good idea of conditions I’m likely to encounter in the American Midwest for professional reasons. So, I would not be so foolish as to declare myself an expert on Arctic/Antarctic climate/weather conditions. Having said that, however– I do not hesitate to call the idea that polynyas will disappear the leavings of the South end of a North-bound horse. More computer modeling, no doubt. I can model ANYTHING in a computer if I feed it the “right” data. 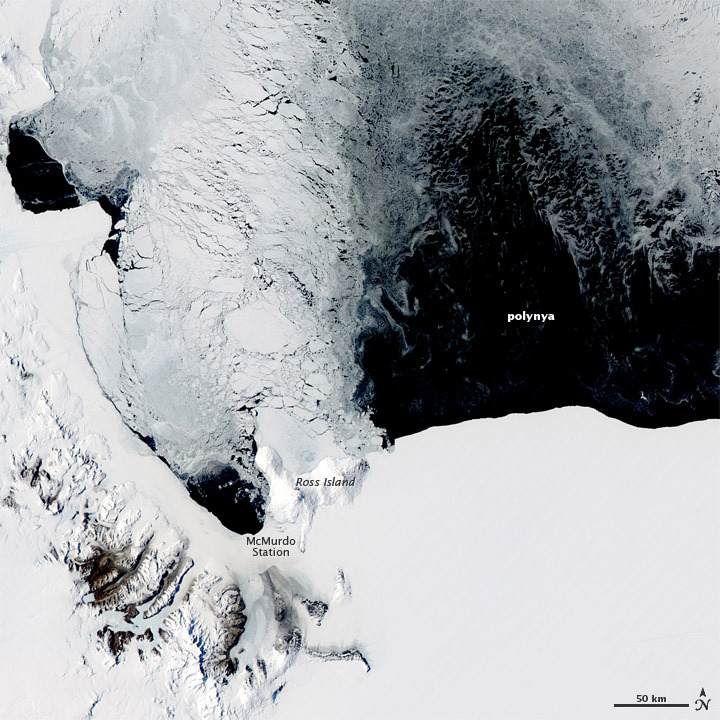 The image of the Ross Sea polynya is pretty irrelevant, since there is always a polynya in the Ross Sea in summer (or at least there has been one every time the area has been visited since it was discovered by Ross in 1841). Not so in the Weddell sea though it was apparently largely ice-free in 1823 when discovered by, you guessed it, Weddell, but as far as known this has never happened again. Instead the Weddell sea has been notorious för heavy pack ice, not polynyas. It took 90 years until somebody managed to get into it again (Filchner 1911-1912). His ship got caught in the ice but managed to get loose after drifting for a year. Shackleton tried next in 1914, but was less lucky, he got caught in the ice and had his ship crushed. The Weddell sea remained the last unmapped coastline on Earth until the Ronne expedition in 1947-48. So, yes, I think it could be argued that open water is a rare event in the Weddell sea. There is certainly no evidence to the contrary. Antarctic Bottom Water. Sounds refreshing,….. The stories these paid shills (formerly known as scientists) are spewing, just keep getting more unbelievable, as their desperation sets in. They’re not fooling anyone. When I saw that Nature Climate Change had published the work, I knew that my psyche was once again about to be battered with feelings of sadness and inadequacy at no longer being young enough to read through all of the pretzel- logic twists and incredulous propositions and emerge at the end of the article thinking that I “understood” what the authors were talking about. Oh, to be young and stupid, again. If less dense surface water stops heat coming up, logically should it not stop atmospheric heat reaching the depths? I am quite certain that if the frequency of polynyas was on the increase, after much careful study, the only reasonable explanation would be that it is unequivocally due to global warming. The science is all settled but they keep on making all these new discoveries of which they had no previous knowledge. This gives them even greater confidence that the Science is settled, as they have just settled it again. They have 97% confidence that the grants will continue to roll on in, as long as they can continue to fool the public all of the time. How does lower salinity water repel or block higher salinity? Don’t different concentrations tend to move into one another and mix? Maybe I’m missing something or didn’t read carefully. For those of you who understand the saline currents… (I don’t) Would not the warming of the planet increase the saline gradients poles to equator? ie more polar melting > more fresh dense fresh water at the poles thereby forcing current flows to the equator where there is more evaporation and very high salinity but lower density water. I am not an oceanographer. Could the polynyas contribute to an increase in the conveyor belt? That is, I don’t see why the polynyas would suppress anything necessarily. What principle am I missing? More desperate arm waving. “hiding the heat” is like Joe McCarthy hunting commies in the 1950’s. Um, can somebody explain to me how an ocean becomes “wetter”? I need this explained to me because I must admit that I was unaware that an ocean was a “wet place.” How wet can an ocean be? Is there a scale of wetness? Is there wet, wetter, and wettiest? Different shades of wetness? How wet can a wetty thing be if a wetty thing can be wet? I have read plenty of ludicrous things concerning the effects of the cloven hoofed, pitchfork toting, all powerful CO2 molecule, but the gyrations presented in this article genuinely makes me wonder if we’ve reached a stage where our halls of higher education have taken what could’ve been rational human beings, and turned them into indoctrinated, enthusiastic, thoroughgoing idiots. And, of course, the press release includes the obligatory it’ll-come-back-to-haunt-us clause. Did anyone ask Chris Turney? They need to get their story straight. Less saline surface waters are preventing “deep ocean heat” from warming the planet, thus “explaining” the warming halt. But the atmosphere is supposed to be the source of the heating! So any heat in the deep oceans must have come from a time when the atmosphere was cooler, so a connection between the atmosphere and the deep oceans should increase the rate of heat flow downwards, not upwards, and thus lessen cooling, while a disconnection should be making the heating go up even faster. Either way the halt is evidence against the theory, but this “explanation” makes their case even weaker. Excellent post, Mr. Watts. Also, a good read. (I really enjoy your “nature features.”) You are getting sharper with age. Of course, this stuff would only apply in the Antarctic. The Arctic is different, of course, where salinity is not relevant and ‘deep ocean heat’ somehow does not come to surface. So there CO2 is the reason behind a slowly retreating summer icecap, but in Antarctica “rising deep ocean heat” somehow causes the icecap to expand. Even by ‘climate science’ standards this is quite special. As soon as I read this part: “… The 1970s polynya may have been the last gasp of what was previously a more common feature of the Southern Ocean, and which is now suppressed due to the effects of climate change on ocean salinity.”, I stopped. It’s revisionist history to fit the AGW meme. No need to read further. If this lid of fresh water has been progressively preventing mixing since the 1950s, how did all that heat get in the deep oceans in the first place? Remember that these rocket surgeons (and their predecessors) were telling us in the 70′s that global cooling was going to cause an ice age. Climate witch doctors at work. What gets to me is the talk of “warm” deep waters. The waters down deep in the oceans are quite cold, only a few degrees above freezing. Only in Antarctica could such water be called “warm,” because water up at the surface, if not frozen, is right at freezing. Second, consider the fact they claim the water at the surface is “fresh.” If it was fresh, there would be a massive die-off of salt-water creatures. In actual fact it is only slightly less saline. I’m not sure of the details, but if the situation is anything like the situation in the arctic, the “freshwater lens” is still so salty that it will not freeze until nearly as cold as “ordinary” salt water. We are talking a difference of a tenth or two-tenths of a degree. Rather than freezing at minus-1.9 degrees the water freezes at minus-1.7 degrees. Will this slight difference in salinity make all that much of a difference? Remember, the Katabatic winds come screaming down from the highlands at gale force, storm force, and even hurricane force, at temperatures that can be down below minus-fifty. They rip and tear at the surface water, freezing it nearly as rapidly as they drive the ice off-shore. Will a slight difference in salinity matter a hill of beans, in such extreme situations? Lastly, consider the fact that having winds of fifty-below to nearly a-hundred-below churning open sea water freezes the water so swiftly that a veritable rain of salt (or salt brine) falls from newly formed ice. There are videos of the brine sinking in shallow places, and being so cold that it freezes starfish solid even as they crawl along the bottom. And, even with this rain of salt descending, these scientists are worried about the water being too fresh? The ARGO system indicates the deep oceans are not warming up. They don’t mention the elephant in the room: those katabatic winds. Do we have 40 years of history of the strength of the katabatic winds in the region? Thought not. For Hunter above: The “commies” Joe McCarthy hunted turned out to be real according to Russian documents. Yeah, reminds me of another article discussed here a few months ago. Some climate scientists were claiming that there is less snow beneath fir trees than in open areas because of down radiation from the trees. I calculated once that glacial melt from the continent had no hope of changing the salinity conditions around Antarctica whatsoever. It has to come from fresh-water glaciers on land/ice-shelves. Since this amount of melting is extremely small in relative terms compared to the hundreds of thousands of sq./cubic kilometers of ocean, it can make no difference at all. The math does not work. Climate science papers never go this far. It is always just musing about the apocalypse rather than proving their point with the hard numbers. What pathetic drivel, pitched as catastrophism! The asinine statements of unfounded conjecture contained in this statement alone shows clearly their ‘analyses’ were not motivated by scientific understanding of either emergent trends or chaotic behavior. This theory does not seem to jive with a recent Discovery(?) show where they had an underwater shot showing a rivulet of melting water sink to the bottom of the Antarctic which enveloped and froze small creatures/plants (don’t remember what they were.) Fresh water would have had too low a SG to sink, and just where did the highly salty water that would have been heavy enough to sink come from? Of the 19 professors listed on the McGill Atmospheric and Oceanic Studies, only 3 are at McGill while 5 are Emeritus. The rest are based at different universities including Penn State. What kind of department is that? And for that they have 8 administrative staff. Fixed it for you. And I didn’t change their meaning, only the way they expressed their alarmism. It is summer time in Antarctica right now. Or are they back dating, either way it is irrelevant. More desperate arm waving. “hiding the heat” is like Joe McCarthy hunting commies in the 1950′s. No. There actually were commies in the US in the1950s, and we now have confirmation from Russian commies that they were pretty much where Joe said they were. Their study, published in Nature Climate Change, shows that the ocean’s surface has been steadily getting less salty since the 1950s. Global warming is so magical, it can alter the salinity of oceans in the past. So global warming makes Antarctica warm and melts the ice. This makes a layer of fresh water which traps warmer water underneath it. 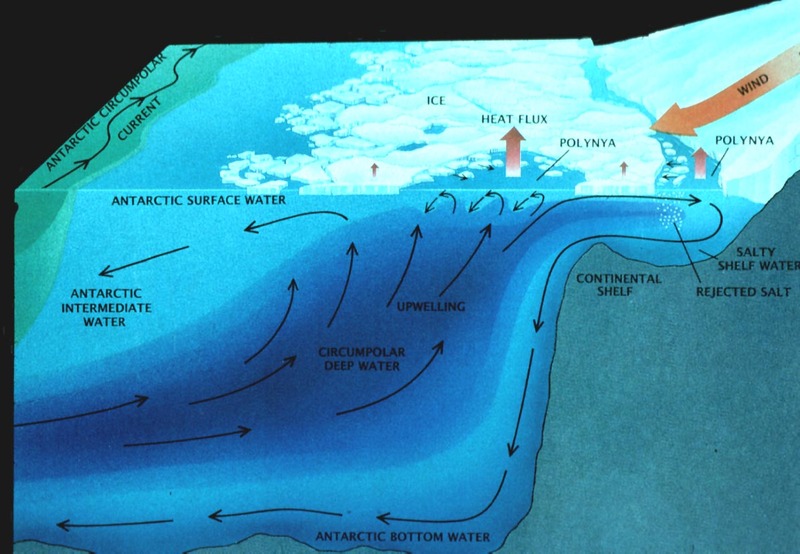 The heat from the warmer water cannot get up through the fresh water, so the Antarctic gets cold. Because it is cold, the fresh water freezes. So warming the Antarctic makes it colder and melting the ice makes it freeze. There are quite a few undersea volcanic vents in the seas around Antarctica. But fresh water comes from sea ice melts, and it is lighter than sea water I believe. So no marine life are there in fresh water they all go deeper. I just think this report is so out of date, why don’t they give a really update. Maybe will see the Southern lights in Australia, down in Tasmania perhaps. 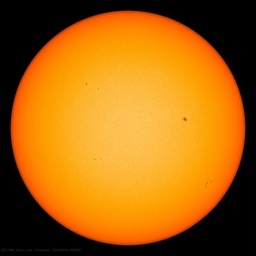 Because of the solar activity. I thought it was common knowledge that polynyas form because of the wind pattern, but apparently it isn’t. Didn’t know that pollyannas were a critical part of Antarctic life, but now I do. So the fresh water blocks out the heat from the salt water. They do know that pumping heat to Antarctica, is a fools game. That place has no way to get rid of heat, so it will just warm the place up. And you can’t just keep going further south. Is pretty much anything and everything caused by global warming now? Is that “science” settled? Why is everything caused by global warming bad? So there’s Ninja heat lurking in the deep oceans, waiting until we least expect it to strike. Gotcha, I’ll try not to lose any sleep over that. -Turns out there were plenty of communists here in the U.S. in the 1950s. The “McCarthyism” myth is just a myth to keep us democrats off the trail, not questioning as Marxists roll over our party. —Look – over there!! a white conservative racist!!! Bark!! Pant, pant, Bark!!! –Bark, bark, pant, pant, bark, bark, must foam at mouth!!!! Returning Vets are likely terrorists!! Pant, bark!! Pro-life advocates are likely terrorists!!! Bark, pant!!!! Mexican-Americans will be offended if someone flies an American flag!!! Pant, Bark, Pant!!!! So the story today is that Antarctic bottom water downwelling is reducing and lower salinity at the Southern ocean surface is preventing mixing. This, unsurprisingly, is close to the exact opposite of the reality. Ice formation at the surface causes formation of very cold super-saline water which drives the downwelling. This is the driver of the THC and also occurs at locations such as the Norwegian sea near the Arctic. So the current increase in Antarctic sea ice inescapably means more, not less, Antarctic downwelling and “Antarctic bottom water”. My Antarctic Bottom Water cleared up when I changed my diet. I suspect that is a lot more true that most climate scientists would like. There appears to be an ~60 year wriggle (must not call it a cycle) in all of the climate data to date that most seems quite capable of ignoring. I know B.S. when I see it and so does most everyone else. The question that needs to be begged is exactly where is this decades worth of latent heat trapped? One cannot make such projections if one doesn’t know if it exists. Is the heat trapped in the deep reaches of the Marianas Trench? The South Atlantic? The Indian Ocean? Enquirering minds want to know. 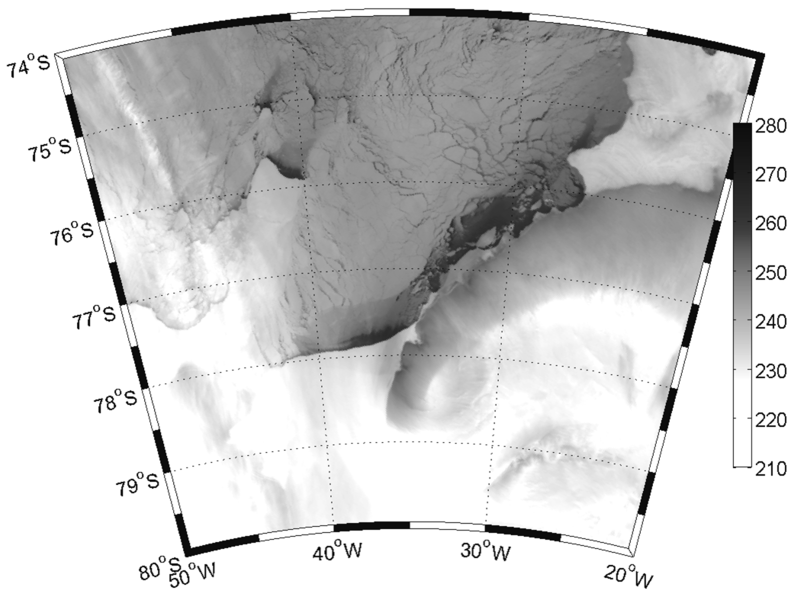 There is a giant Weddell Sea Polynya referred to and described in the McGill article is a thermal Polynya, generated by up-welling of warm water. The article claims that such Polynya’s have not reappeared. The Polynya’s described by Mr. Watts in his rebuttal are Polynya’s generated by strong Kabatic Winds, which break up the surface ice and transport it away from the shore, opening a hole in the pack ice. This is a different phenomenon and its existence does not invalidate the statement in the McGill article, which was about thermally generate Polynyas. Eric A is absolutely right. There are plenty of coastal polynyas around Antarctica, because strong winds blowing off the continent keep pushing the ice away. That’s how they stay free of ice, even though the air over the water is colder than North Dakota in a cold snap. The big Weddell Polynya was very different, because it formed far from the coast, was much bigger, and was kept ice-free because of lots of upward mixing of RELATIVELY warm water from underneath. The reason the polynya was especially important was not the hole in the ice itself – it was the upward mixing of water from the deep ocean underneath. Relatively warm water, around Antarctica, means about 2 degrees C – which is not exactly warm enough for a swim, but it’s warmer than the freezing point (about -1.8 C) so the ice can’t grow. The reason this relatively warm water was there was because it was mixing up from a couple of miles below. The deep water there is relatively warm because some of it started out in the Mediterranean, and other tropical places – it made its way into the deep ocean around Antarctica by slowly flowing south over many centuries. Now, there’s more rain and snow falling on the ocean around Antarctica than there was fifty years ago, diluting it, so the surface isn’t as salty as it was before. It’s a small change – less than one percent – but mixing in the ocean is very sensitive to small changes. The less salty water on top has harder time mixing with the water underneath. I agree, it’s surprising that it’s so sensitive! The climate system does lots of surprising things, that’s what keeps it interesting. However, I’m not surprised that there’s a fair-sized polynya next to the Antarctic shelf in the Weddell Sea right now, as shown in the images above. Most of the Antarctic sea ice melts in summer, and March is the end of summer in Antarctica. The 1974-1976 Weddell polyna was very different because it was large, in deep water, and stayed ice-free for 3 full Antarctic winters. Ha! I knew it! Heat has stopped flowing from warm to cold. Needs more salt. Just a pinch. I love Arctic Ice Holes the more they pop up the better I like it. That is interesting. What is known about these types of polynyas from a historical perspective, say over the last one hundred years? Great question – unfortunately, there weren’t many opportunities to observe the Weddell Sea ice pack in winter, before the NIMBUS-5 satellite was launched in 1972. One clue is that a German expedition in the 1920s came back with early oceanographic measurements they interpreted as showing deep mixing in the Weddell Sea at that time – very different than today, and as we now know would be expected had there been a large offshore polynya at the time. And there are some declassified military satellite photos from the early 1960s that seem to show a polynya, though there is a lot of cloud cover so it’s hard to be sure. The big Weddell polynya was probably always a variable feature – there some years, and not there other years. Hopefully someone will come up with a clever way of reconstructing how it varied in the past from some kind of geological archive. Radiocarbon measurements in deep sea corals from the Maud rise (a seamount beneath the place where the polynya formed) would probably work, for example. to goldminor: So far, we don’t know much about the thermally-driven polynyas on the centennial scale, because the observational record is short and sparsely sampled before the satellite era. However, there were signatures of this type of deep convection in ship-based measurements from the late 1920s and 1960s, so the 1970s polynya is not thought to be an isolated event. The main point of the research article is that in the time since the last observed open-ocean polynya, there has been measurable freshening of the surface ocean south of the Antarctic Circumpolar Current, this freshening is an expected consequence of global warming, and it inhibits vertical mixing of the water column. Moreover, the degree of freshening observed in nature is quite similar to the freshening simulated by the latest generation of climate models just as the model deep polynyas — a robust feature of the simulated preindustrial circulation — weaken and disappear. As long as satellites are collecting data, scientists will be on the lookout for the return of these features, which is a possibility despite the surface freshening. We should also scour coral proxies and sediment cores to understand how frequent these events were in the more distant past. In the meantime, the paper presents a hypothesis: that the absence of Southern Ocean deep convection is linked to the climate driven spin-up of the hydrological cycle. As with all science, future research will put this hypothesis to the test. Entropy, does’nt that tend to suggest that the salty water will mix with the fresh, so that the deep ocean waters will mix up with the less deep and the heat will spread through the whole ocean. ” The reason the polynya was especially important was not the hole in the ice itself – it was the upward mixing of water from the deep ocean underneath. Sounds good. It is there for reasonable to conclude that these thermal polynya are artifacts from the medieval warm period and were shut down by the little ice age? If their absence persists for an equivalent time span as the LIA I would say you are on to something. This would pretty much put anthropogenic CO2 as a cause of any of this through the ropes, out of the ring, out of the arena and into the dumpster. The kinetic energy of this system you describe is enormous. It sure sounds like natural variability to me, on centennial and millennial time scales, driven by a variable sun in a variable heliosphere in a variable universe. The weather, the climate, these are artifacts of Earth chasing after equilibrium in a chronically unbalanced energy system as the Earth turns from light to dark to light, through the seasons of the year, swinging near the sun, then far from the sun. CO2 variability is an artifact of this system also. What’s happening right now in the Antarctic is summer/fall, not a polynya. A defining characteristic of a polynya is not merely that an area is ice free, but also that you would expect it to be ice-covered (on grounds of it being winter, and you have ice all around it). You may examine the Southern Hemisphere sea ice animations (whole hemisphere) at http://polar.ncep.noaa.gov/seaice/Historical.html The last Weddell polynya was the 2000 one which was quite trivial — a few days of a small area of reduced concentration. For polynya-hunting, you want June-July-August-September. You can also look at previous February-March monthly animations at that same page, and decide how surprised you are that a patch the southeastern Weddell sea is currently ice-free. Readers should also notice that what’s at hand is _Bottom_ Water. This is deeper than 3000 meters. When oceanographers are discussing observations of heat in the _deep_ ocean, this is only down to about 2000 meters.